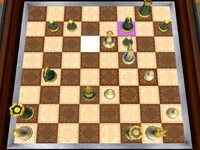 3D Chess is a thinking and strategy game that trains your logic and strategic skills. You can play with a friend on the same device or play against the computer. You can select one of 7 difficulties (from 0 to 6)) which matches your abilities best. Game Controls: Click on the chess piece, than on a free cell to move it.